Is your dog taking you for a walk? Are you having trouble communicating basic obedience commands to your dog? Is your dog training you? At Hill Country Pet Ranch here in Boerne, TX we use dog-friendly techniques and positive reinforcement dog training methods, incorporating treats and play. 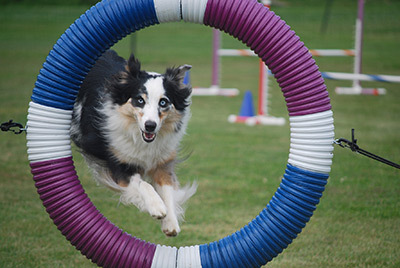 All dog training is individualized based on breed, age, and temperament. There is no one size fits all approach. We utilize training games to allow the dogs to think and make the correct choices themselves, so they can discover and maintain the fun in training. We're easy to get to from the entire Northwest San Antonio area. The first few months of your puppy’s life are the most important for acclimating him to different situations, dogs, and people as well as providing the structure pups need. We provide puppy training for puppies as young as 10 weeks of age can participate in our programs. The sooner we start the better. However, it’s never too late. We will help you create a safe home environment and a solid foundation for you to enjoy your ‘puppy’ for a very, very long time. A well-behaved dog enjoys a happier relationship with its family. Our Basic Manners dog training is available to older puppies and dogs who have not yet mastered a foundation of basic obedience. We also offer private dog training lessons. Perfect for busy schedules, ask us about our Lodge & Learn program here at Hill Country Pet Ranch in Boerne, TX when scheduling your pet’s next stay. After your dog’s initial training, we are there to provide ongoing support and activities for your dog’s life. Our Advanced Training is available to dogs of all ages for both on and off leash training. Our trainers will provide a foundation of positive and proven basic skill and more advanced off-leash obedience.